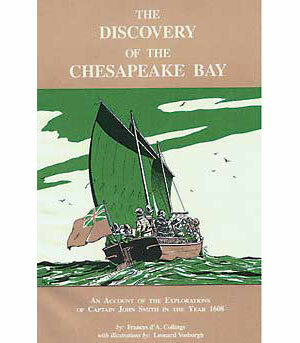 Captain John Smith (1580-1631) was the first European to explore the Chesapeake Bay. During the summer of 1608, he and a handful of men from the year-old English settlement at Jamestown took a small open boat on two extensive trips up the Bay, eventually reaching its head where it merges into the Susquehanna River. They experienced formidable dangers and hardships on the way, including numerous encounters with hostile Indians, yet returned safely and in good spirits with the loss of only one man, who died of natural causes. Others would follow later and map in the details, but it was Smith's little expedition, which first established the shape and extent of this, the largest estuary in North America, and proved conclusively that it was not the hoped-for passage through to the Western Ocean. Four years later, back in England, he would draw up a map of the Bay, which can still be used as a guide today without going too far astray. There is very little literature available on Smith's discovery of the Bay, which in most histories is treated as a diversion. This book aims to fill that small gap in the historical record and, at the same time, provide instruction and entertainment to those who know and love the Bay today.